I learned to nurse in Edinburgh. There is nothing quite like the education you receive in life when you work with people at different stages in their lives. Whilst there are many sad times you witness at a very tender age as a student nurse, there is always laughter too. Perhaps it's a human need to find laughter in the face of so much? But I do think when people connect together in times of stress and illness, bonds are quickly formed that allow an honesty to emerge if we let it. In those points of connection be they through tears or laughter, there is a kind of healing. It was some of the older Edinburgh folk I remember so well. They were an age group when I was young nurse, who had survived so much. Two world wars had robbed them of family, friends and potential life partners. We frequently met elderly unmarried women who lived alone in tenement flats that became their prisons. But many were made of stern stuff, I used to think it was something in the water here that created such feistiness! Of course they had had to survive through hard years alone in straightened circumstances. Many of course had tales to tell and it's one such woman's twinkly eyed response I recalled recently when we chatted together about her past" pit it this way, hen, I'll no die wonderin' " she confided to me. We giggled and I said good for you! I loved her honesty and sense of mischief. It seemed a good motto for life...don't die wondering about what might have been.I'm not suggesting a life of things that wouldn't pass the "would you tell your mother" test of course but more don't regret not trying something you would love to do. I'm not one to rush into decisions and I like to look at all the implications but I know also that the final test I like to apply is will I regret not giving it a go. And if the answer is yes, then I find the courage from somewhere to take the next step. My challenge is I'm hard on myself as I do that and this week I have been reminded of that. I've been in a bit of pain and finally got some help with it. I had tried getting annoyed with myself, pushing to my limits, ignoring it and even had tears of frustration but finally reminded myself of the teaching on the WEL. In the WEL course we reminded that for life to thrive it needs nurturing. To help us really internalise that process we are encouraged to think about how we might treat a plant or a pet to deepen the understanding in ourselves of how to care for our own needs better. So this week I plan to treat myself like a lurcher! I will have regular exercise, rest as much as I can, eat regularly and who knows i might even do what I'm told.......most of the time! So maybe the motto for my life needs to be ...don't die wondering but be willing to give yourself a break too? I'm aye learning! A change of age unfolds....1000 women find their voice. I came to blogging through my experience of breast cancer while working as a Director for Scotland of Breakthrough Breast Cancer. I set up the organisation in Scotland for Breakthrough and as I had been diagnosed with breast cancer in my thirties and knew for all the change in attitudes towards breast cancer, there was still much to do. When I started in that role I was aware of the power of the breast cancer sisterhood. The shared stories that connected us, the warmth of that bond, the empathy that meant words need not always be spoken to be heard. The power is immense, it's a special kind of healing that emerges as a consequence. When I was diagnosed a second time when I was with Breakthrough I knew secrecy was impossible and that perhaps sharing my story would help others, having the unique platform that I did. And so my blogging journey began. Since then I have plotted surgery , recovery, loss and renewal, I have advocated for change in health and social care, in leadership and in society. More recently too I have even touched on the referendum in Scotland. I have always been a political animal but for the first time in my life I became politically active. The referendum now has passed, the result was 55% voted to stay as part of the UK so game over and back to how things were ( aside from more devolution on the table of course! ).But since this weekend I'm quite sure that will not happen. We are living in a change of age here in Scotland and I am still making sense of it all, in my life and in my work too. 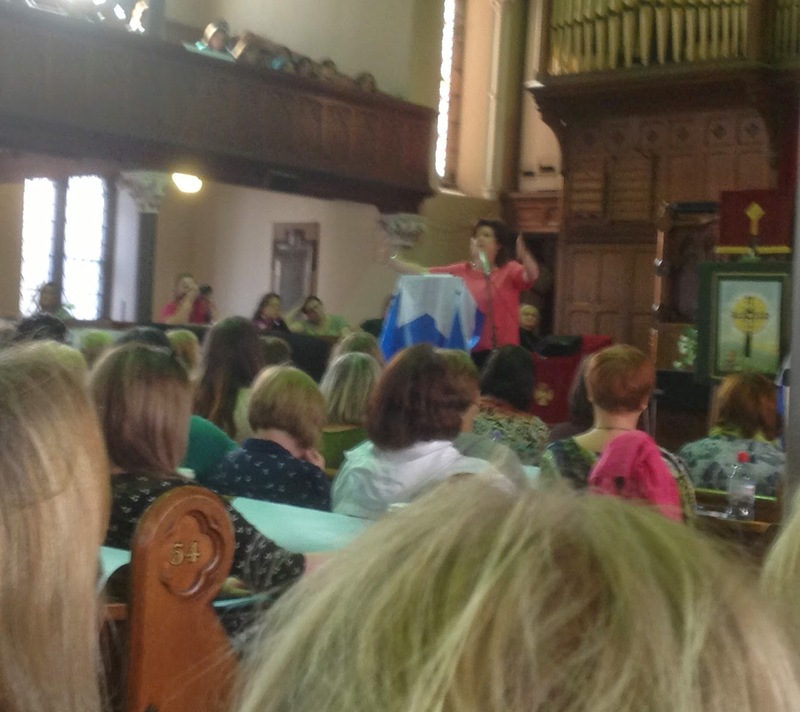 On Saturday I went to an event where 1000 women gathered as Women for Independence and for Independence for Women too. I witnessed a social movement, a women's movement unfold and its awe inspiring. The speakers were excellent but the real stars were the women who got up at the open mic session and told their stories. Some were miraculous stories of conversion to YES for independence but perhaps what was most moving were their stories of finding their voice in that process. As someone described it...no one had asked what I thought before. In a process where very vote counted; every voice counted. Many of those voices had never been heard before; no one had listened. One woman described until recently she had been agoraphobic but the through process of her political and social awakening she not only found her voice, she found her courage too. Her depression lifted as a result and she was able to re-engage with the world. The cheers from all collected said it all. We were asked our opinions and we gave them with the peer group who organised the event giving commitment that the approach would maintain inclusiveness at its core, that people would be encouraged to self organise as had happened naturally till then. Indeed new groups have sprung up since the referendum and many of those there, had become active since-not before the vote. It's an organic movement enfolding day by day and no one knows what will happen next. The women were clear that this would be a movement that reached out to all women and that they wanted to learn how best to effect change. I have no doubt this is a social movement as well as a political movement. It's not only the new politics, it's the new world we live and work in. We are still trying to respond to it through existing paradigms and that won't work. Traditional political parties look on with awe and the recent party conferences have seemed strangely out of step. The smart money is on those who will inspire, motivate and enable the community of support with a shared passion and cause. As someone who has studied public health I was interested to learn that the messages particularly around the gap between rich and poor seemed to be the ones that influenced the vote especially in the last few weeks. It seems that economic and health inequalities are important in this social movement. The call for a fairer and more equal society is not going away. And what I experienced was a sense of community, an "all of us first" mindset as described by " The Common Weal"
It's not only women of course who are part of this movement and call for change. And indeed it's not only in Scotland. Social media is a powerful tool in this and blogging a key part. As a breast cancer blogger I'm part of a global network ( see Journey Beyond Breast Cancer) and have made connections across many boundaries. This has enriched my life, connected me in very meaningful ways and I have learned from so many others. Blogging is only one way to find your voice of course but whats even more important is that we listen to those voices, especially the ones so rarely heard. That's where the transformations in our lives and work will be seeded. You got a friend this October? Join the Breakthrough Bake Off, Im with dog here! I've been planning my week ahead and knew that its coming; breast cancer awareness month that is. No longer do I have to dress in pink, to go about my work but nonetheless the reality is that October is still very pink. My careful packaging away of my own history, to be pulled out when I approach my review appointment in December, is no longer intact. It's insidious at first; some articles appear in women's magazines. Stories of survival abound. The ones who don't are less spoken of this month it seems. There are the others too of course, who wouldn't describe themselves as survivors, living with metastatic cancer who can feel in the shadow of the pink hued October time. But for many of them their daily life has become survival, their personal marathons to live with pain, fatigue and more. Somehow that pink ribbon just doesn't really seem cut it for them. Of course breast awareness is important and I'm grateful for that focus and hope this month too will save lives through early diagnosis. Also the breast cancer charities rely on this month to raise much needed income to do their research, support and information, all of which help. So do what you can, it makes a difference. And share this TLC message to friends too; we all need to be breast aware. But don't forget the impact on your friends with breast cancer, don't think that it's gone now they are back to work, or had good news at a follow up. And even more important are those friends who don't get the good news, who live everyday with metastatic cancer, please make sure they don't disappear into your shadows. Be their friend still. I saw James Taylor this week in Glasgow and he was wonderful.His hair may different from the poster I lovingly gazed at on my bedroom wall as a teenager but his voice is still beautiful. As he sang You Got a Friend I remembered the time after my first diagnosis of breast cancer, watching him sing this song on a TV programme with the tears rolling down my cheeks, knowing that that message was so important to me and mine then. To know you've got a friend means so much. Look after your friends this month....and all the other ones too of course.